Rooting means getting the complete control of your phone from the manufacturer. Rooting can improve features of your device. you can create and flash custom ROMs. Root access allows you to run your own software with high privileges.in iphones it is called jailbreak. in short with Root access you have complete command of your phone in your fingers.. If you are a type of person that likes to tinker then it does not mean than only Linux based Operating system and Android are for you. You should be close to windows phone too but it seems embarrassing because both Microsoft as well as Nokia have made Windows phones more difficult to break into a low-level by locking down their bootloaders. There are always some people who are anxious to take full use of their smartphones like Lumia or windows, To get full of a smartphone Rooting required. Earlier this was dream for Lumia or windows phone users but Heathcliff74 made this dream came true. 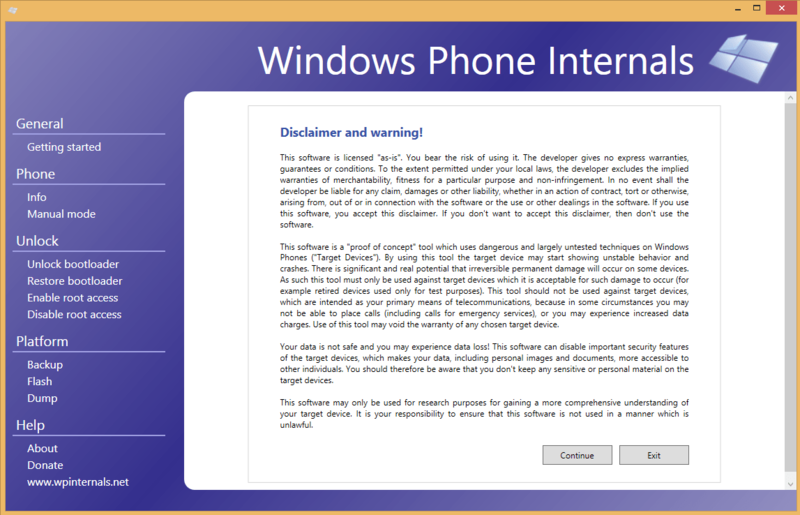 yesterday a software hacker and XDA Developer Heathcliff74 ( mostly known for WP 7 tools ) released a new tool that called Windows Phone Internals which made it easy to unlock or Root any windows phone or You can also run custom roms on lumia. The software is available for free to download here. if you found tool useful which is it ,you can donate to developer. Windows Phone Internals receiving high traffic from last two days. 18000 downloads in just two days.Can’t believe how many people wants to install custom roms in windows phone. if you want to enable Root access, bootloader must be unlocked first. Root Access is only supported on the models mentioned below. First download tool from here. Currently there is only windows version of tool. follow simple configuration on your computer screen. Heathcliff74 also mentioned that you should think twice before unroot/unlock your device. This will reduce the chance of malware or other bad stuff moving around your smartphone. As Rooting do in android or in other smartphones , same here you will loose your warranty. Your smartphone may not work properly, it may become non functional. how can i download ffu image all naccessary files etc etc.. I want unlock and flash custom rom. But my nokia 1320 isnot recognised my laptop. But it is charging. Only usb problem icant do anything. Please anybody help me urgently.